Hitachi Rail Europe is among the bidders hoping to win the £2.75bn contract to build 60 trains at its Newton Aycliffe site. The first UK-built Intercity Express (IEP) train has been unveiled at the Hitachi factory in County Durham. It is one of 122 express trains which are part of the Government-funded £5.7 billion Intercity Express Programme. 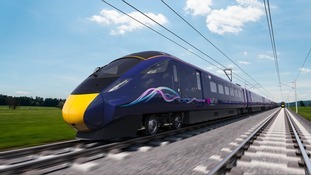 The first UK-built Intercity Express (IEP) train has been unveiled at Hitachi in County Durham. It is one of 122 express trains which are part of the Government-funded £5.7 billion Intercity Express Programme designed to boost capacity, reliability and comfort for passengers. Hitachi is building 122 new intercity trains, and these more modern trains will offer more capacity for passengers, more reliable journeys, and 21st century technology. These trains will run on the Great Western mainline from 2017 and the East Coast mainline from 2018. From Inverness to Swansea, Aberdeen to Oxford, connecting the communities the length and breadth of Britain. Hitachi will launch its first Intercity Express train built at its manufacturing plant in County Durham. Hitachi is set to take on 150 new workers at its plant in Newton Aycliffe, in County Durham. Leave campaigners have disputed the claim that Britain leaving the EU would damage the security of north east jobs. The Prime Minister is at Hitachi's Newton Aycliffe train factory for a speech about the debate. Vote leave supporters have said that the notion investment into the North East would be jeopardised by a vote to leave is 'ludicrous'.